George Parsons Hester was born in St Peter-in-the East parish, Oxford on 19 April 1798 and baptised at All Saints' Church on 16 May. He was the eldest son of John Hester and Susannah Torry, who had two other children baptised at that church: James Torry Hester (1800) and Ann Hester (1802). George’s father John Hester (born in 1776), was made a freeman of Oxford by Act on 2 May 1796: he was described as a cook in both 1820 and 1821 when his two sons were admitted free, but was later more grandly described as Steward and then Manciple of All Souls College. George Parsons Hester was a chorister at Magdalen College School from 1807 to 1814. By 1823 he was a solicitor in Oxford’s High Street by 1823, but was described as being of St Aldate’s parish in 1824. For more about the parents of George Parsons Hester, see the grave of his mother, Susannah Hester. Mary Hazel was born in Benson on 7 December 1805 and baptised there on 7 January 1806. She was the daughter of the Revd William Hazel and Mary Eaton, who were married at Cumnor church on 25 November 1802. For more about her parents and her nine siblings, see the grave of her mother, Mrs Mary Hazel. Eleanor Hester (born at The Mount, Banbury Road in 1852 and baptised at St Giles’s Church on 14 April). In about 1824 George Parsons Hester moved with his new wife to Bicester, where he was a successor to Mr Walford. He relinquished his business to Mr Osmond and returned to Oxford, and his office was listed in Cornmarket in Pigot’s Directory for 1830. By 1831 the address of his office is given as St Aldate’s, and specifically in 1839 as 6 St Aldate’s; and in 1841 it is described as being in the yard of the old Town Hall. The following year he went into partnership, and there is a listing for “Hester & Hazel, attorneys” at the Town Hall from 1842 to 1850. He also acted as Steward of All Souls College while in partnership with Hazel. Hester was also an Oxford city councillor for the North Ward from October 1831 until 1838, when he resigned on being appointed Town Clerk of Oxford. Hester was appointed Town Clerk of Oxford in 1838. He laid out the streets of Osney in 1851, and then went to work on the city archives: he sorted them himself and produced the first Schedule of City Property in 1855. He was instrumental in the development of north Oxford, including what is now St Margaret’s parish. At the time of the 1841 census Hester and his wife and six of their children were living at St Giles's Field, looked after by three servants. Their two eldest sons John (12) and William (9) were staying their in the home in Portsmouth of their maternal uncle William Hazel, who was headmaster of Portsmouth Grammar School, and they probably attended there. Hunt’s Oxford Directory for 1846 shows Hester living in a house on the Banbury Road beyond North Parade, which must have been The Mount. Between 1849 and 1865 Hester’s sons John, William, George, and Frederick were all made Freemen of Oxford. † Francis Hester died at the age of 14 on 29 December 1850 and was buried at St Sepulchre’s Cemetery on 3 January 1851 (burial recorded in the parish register of St Giles’s Church). At the time of the 1851 census the family was living at The Mount on the Banbury Road. George Hester Parsons (52) and his wife Mary (45) still had six of their children at home: John (22), who was an attorney and solicitor; Catherine (20); William (19), who was an engineer); Jane (18); Hester (16); and Anne (11). The family had two servants. George (15), Charles (11) and William (9) were staying at Portsmouth with their maternal uncle the Revd William Hazel, and presumably attended his school. By 1852 Hester’s partnership with Hazel had been dissolved, and Hester was listed in directories on his own as an attorney at both North Parade and Cornmarket. Only one of Hester's six sons went to university: George Hester, who was matriculated at the University of Oxford by All Souls College on 27 October 1852 at the age of 17 (obtaining his B.A. in 1856 and M.A. in 1862). Edward Delamotte, son of the artist William Delamotte. In 1854 Hester signed a petition for a new church in north Oxford, promising to contribute to the erection of a church and its endowment, and SS Philip & James Church opened in 1862. 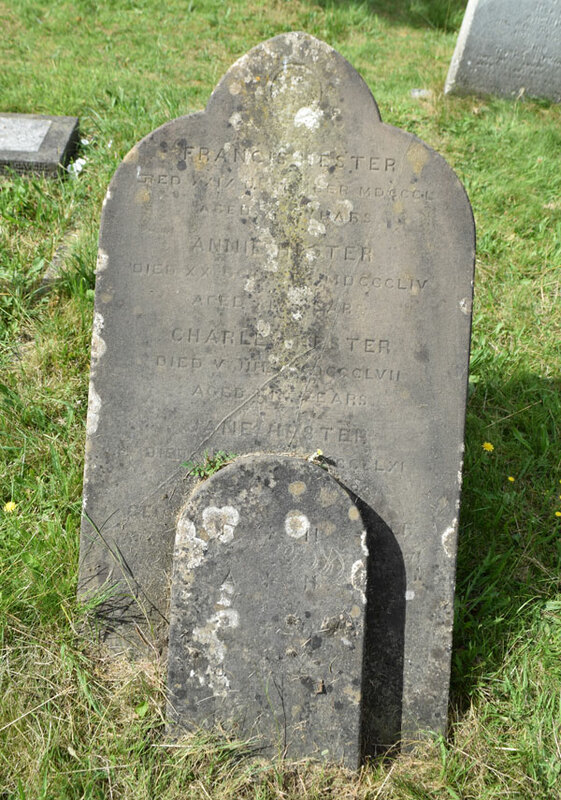 † Annie Hester died at the age of 14 on 20 October 1854 and was buried with her brother at St Sepulchre’s Cemetery on 24 October (burial recorded in the parish register of St Giles’s Church). † Charles Hester died at the age of 19 on 5 July 1857 at the age of 19 and was buried with his brother and sister at St Sepulchre’s Cemetery on 8 July (burial recorded in the parish register of St Giles’s Church). At the time of the 1861 census George (62) and Mary (5) were at home with Jane (27), Mary (26), and Frederick (18), who was an attorney’s clerk. They had three servants: a cook, housemaid, and nurse. Eleanor (9) was paying a visit to her maternal aunt Jane Hazel, and her uncle James, a farmer of the same surname, in Sutton Courtenay. Their son George (25) was a teacher, living at Ash Surrey in 1861, looked after by a housekeeper, the widow Mrs Grant, who had a 14-year-old daughter, Margaret Jane. † Jane Hester died at the age 27 on 8 April 1861 and was buried at St Sepulchre’s Cemetery on 11 April (burial recorded in the parish register of St Giles’s Church). Hester's mother died at Park Place in 1863, and her death announcement in Jackson's Oxford Journal read: “May 3, aged 90, Mrs. Susanna Hester, mother of the Town Clerk of this City.” She was buried on 7 May 1863 in a separate grave. In the last quarter of 1869 in Cardiff, George Hester married Margaret Jane Grant, his housekeeper's daughter, who was born in Morayshire, Scotland. At the time of the 1871 census George Parsons Hester (72) and Mary (65) were living at The Mount with Mary (36), Frederick (29), who was an attorney, and Eleanor (19), plus two servants. On 7 February 1875 Hester’s son Frederick Hester died at the age of 33. His death notice in Jackson’s Oxford Journal read: “Feb. 7, at his residence, 117, St. Aldate’s-street, Oxford, of consumption, Frederic Hester, solicitor, in his 34th year.” His burial on 10 February probably took place at Osney Cemetery, as it is recorded in the parish register of St Martin's Church at Carfax. † George Parsons Hester died at The Mount at the age of nearly 78 on 4 February 1876 and was buried in in the family vault in St Sepulchre’s Cemetery (burial recorded in the parish register of both St Giles’s and Ss Philip & James’s Church). The late Mr. G. P. Hester. We announce with regret in our obituary this week the death of Mr. George Parsons Hester, the late Town Clerk of this City. Mr. Hester was appointed to that office on the 16th of September 1838, in place of Mr. T. Roberson, his proposer being Mr. Ald. Sadler, and his seconder the then Mayor (Mr. Ald. Sheen). From that time until about two years since, when failing health compelled him to depute the active duties of the office to his son, Mr. John Hester, he discharged his multifarious duties with acknowledged zeal and ability. He will be especially remembered by the Freemen of this City for the persistency with which he upheld their rights and privileges on all occasions, and also for his endeavours to retain the present Magdalen College School as a free foundation for the City, to accomplish which he filed a bill in Chancery against the College in 1847, but judgment was adverse to him. Mr. Hester was also a man of considerable authority as an antiquarian, and he devoted a vast amount of time and labour in searching for and collecting old documents relating to the City, from which he compiled a schedule of the property belonging to the Corporation. As we have intimated, for the last two years Mr. Hester had been partly incapacitated from attending to his duties, and yielding to pressure, he resigned his office about five weeks ago, and with an unseemly haste, which has drawn forth well-deserved condemnation, his successor was appointed, and the Council formed themselves into a Committee to report upon the best mode of showing their appreciation of his long and valuable services. It is worthy of remark that at the time the vacancy caused by Mr. Roberson’s death arose, Mr. Hester was one of the Councillors for the North Ward, and paid the fine, just as Mr. Hawkins, his successor, did on resigning. Mr. Hester was for some years Steward of All Souls’ College, but he gave up the office on dissolving partnership with Mr. Hazel. He passed quietly away at noon on Friday the 4th inst., at the ripe old age of 78, respected and esteemed by all classes of citizens throughout the City. The funeral took place at St. Paul’s [St Sepulchre’s] Cemetery on Wednesday, and was, in conformity with the deceased’s wish, of the plainest and most unostentatious character. The mourners were Mr. John and Mr George Hester, his sons; Mr De la Motte, his son-in-law; and Mr. Briscoe, surgeon. The service was read by the Rev. J. F. Brown, Curate of St. Philip and St. James’s, a snowstorm prevailing the whole time, and the remains were then deposited in the family vault. Mr. Justice Calcutt was the only member of the Corporation who attended the funeral, though, but for Mr. Hester’s wish, doubtless the Corporation as a body would have been present. His effects came to under £9,000, and his wife and son John were his executors. His family moved to 12 Bevington Road soon after his death. On 2 October 1877 at SS Philip & James's Church, Oxford, Eleanor Hester of Bevington Road married the Revd Albert Octavius Walsh of Banbury Road. † Mrs Mary Hester died at 12 Bevington Road at the age of 74 on 12 May 1880 and was buried in the family vault at St Sepulchre’s Cemetery on 15 May (burial recorded in the parish register of both St Giles’s and Ss Philip & James’s Church). Her effects came to under £50, and her son John was her executor. John Hester (born 1828) remained an attorney & solicitor at 117 St Aldate’s Street. His wife Mary was born in Ely in 1846/7, and may be the Mary Okey who married a John Hester in Chelsea in 1877. They do not appear to have had any children, and continued to live at St Aldate's Street most of their married life. When he died at 180 Abingdon Road on 13 October 1910, he was known as the oldest solicitor in Oxford. His effects came to £1,753 2s. 3d., and probate was granted to his widow. Catherine Hester, Mrs Edward Delamotte (born 1830) does not appear to have had any children. At the time of the 1861 census she was living at the Royal Military College with her husband Edward, who was a drawing master there, and his son from his first marriage. By 1871 Edward was the drawing master at Harrow School, and they were living at London Hill, Harrow. Her husband died in 1896 at the age of 79 in the Farnham district, and Catherine died in Camberley, Surrey, on 11 September 1896. Her effects came to £668 6s 3d. William Hester (born 1831) appears to have emigrated to the USA. George Hester (born 1835) was still a teacher in 1871 and living at Combe, Teignmouth with his wife Margaret and their first baby, and her mother (his former housekeeper) was paying a visit. In 1875 they were in Street, Somerset; in 1877 they were in Sunderland; and in 1881 they were living at Skircoat, Yorkshire with their children Mary (10), George (7), Charles (5), Caroline (4), Margaret (3), and Violet (1). By 1885 they were in the Brighton area, and the 1891 shows them living at 60 Goldstone Villas, Hove: George was working as a tutor; they had a seventh child, Edgar (6); and unlike the rest of his family, they had no servants. George died near the beginning of 1898 at the age of 63. His youngest son Edgar Hazel Hester was killed in the First World War, and a large memorial to him was erected in St Margaret's Church in north Oxford. Eleanor Hester, Mrs Albert Octavius Walsh (born 1852)	went with her husband to India, and her daughter Winifred Mary Walsh was born there in 1881 and her son Frank Hazel Walsh in 1882. They were back in Camberley, Surrey when her son Louis Ronald Walsh was born in 1884, and in Ash, Surrey at the time of the birth of her next three children: twins Gilbert and Doris Walsh in 1885, and Olive Carrington Walsh in 1889. At the time of the 1891 census she was home in the Rectory at Ash with her husband and five of their seven children, plus a nurse and a cook. They were still there in 1911 with their daughters Winifred and Doris. Eleanor died at 12 Lyncombe Hill, Bath on 28 May 1928. Her effects came to £3,677 9s. 9d., and probate was granted to her son Frank, a civil servant.